Help us explore the universe from the park, the train, or the bath*. Following a number of requests we are today releasing the first mobile Zooniverse application: the Galaxy Zoo iPhone app. The app, which will run on iPhones, iPod Touches, and iPads, lets you classify galaxies from our Hubble Galaxy Zoo project from anywhere. It has a slick and simple iPhone interface and will challenge you with the same huge galaxy database as the galaxy zoo website. If you have a long journey ahead and want to pass the time classifying, you can download a stockpile of galaxies via WiFi to keep you going the whole way. And if you run out you can download some more over the 3G or Edge networks. You can find the app on iTunes, by searching for “Galaxy Zoo”, or with this direct link. You can find background information on the help page. The app was developed by Oxford cosmologist Joe Zuntz, along with Arfon Smith and Stuart Lynn. They have a bet with Chris that you’ll be able to classify 1 million galaxies with it, and hope you’ll help them win it. *Please don’t drop your phone in the tub. A link to the app in the iTMS might be a good idea. Stupid me – but your colour scheme made the link very hard to spot. What an exciting application for travelling Zooites ! Thanks for this additional feature in the ZOO. Do one for Android 2.1 OS please. Why only for iPhones ? Yes please, do one for Android 2.1 too. Would be great! Requests for Android apps noted. I’m not sure we’ll get there quickly, but we’d love to one day. Most of the development for the iPhone app was done by Joe Zuntz for fun, but if it demonstrates that there is demand for the Zoo on mobile devices I’m sure it will become a priority. seem to be uploading my classifications. Or is it just that seamless/invisible?? Hi CMitchell. The app will only start sending classifications once you have classified 10 or more galaxies. If you’ve done this can you please email me on arfon@zooniverse.org and I’ll see what I can do to help? Hi – If you’d like help with the Galaxy Zoo port to Android, please email me. I’d love to aid this project. I think this is a great looking app, very intuitive to use and navigate around – it will definitely keep me busy on my long train journeys home each day. Build for android 2.x please! I’ve got an Android phone. Would love to get this app ported to Android. please build for android ! I’d really like this on my Android. In the absence of an app, does anyone know if the main site is usable in the native browser on Android phones? I’ve started an Android application but need help with web-service/API calls. I’d also like to add my voice to the requests for an Android application. As Uilliam MacGiolla Mhártain noted, Android is growing rapidly. I’ve read predictions that it will soon overtake the iOS (if it hasn’t already), and it with Symbian will dominate the markety by 2014. I would love to see Zooniverse projects be available on Android — with how fast it’s growing, I think there needs to be an Android app in addition to the iPhone one. I’d probably be able to do more classifications if I could work on my phone, any time, anywhere. Please consider making an Android app for Zooniverse, the sooner, the better. 😉 Thanks! Whenever I stockpile galaxies the total number increases by 20. I’m currently up to 340 but can see it going up higher and higher, at which point it will be a problem to download them all in a reasonable time. Is this a bug or a feature? 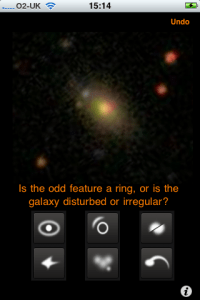 Galaxy Zoo app. on iPhone has stopped working suddenly. Can’t get it back or the update. The updated site doesn’t work with the existing iPhone or Android app – we’re in the process of submitting updates to the relevant app stores but this might take a while to be approved. Once all of that’s done and you update the app it’ll start working again. Sorry for the lack of galaxies in the meantime. PS We did try to email those using the app – sorry you were missed out. Actually, with the new release of Galaxy Zoo a standalone app is no longer needed — you can just go to galaxyzoo.org from your mobile browser and it should work beautifully, especially in full-screen mode!